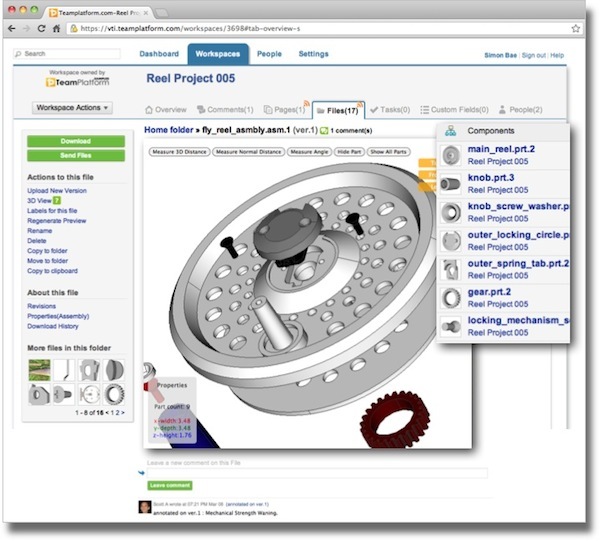 VisPower Technologies announced today that TeamPlatform, a new cloud based 3D CAD Project Collaboration Portal has come out of beta for immediate availability. TeamPlatform empowers any engineering company to create white-label 3D CAD project collaboration portals instantly and very affordably. “Our founding members with 50 years of combined experience in engineering software development believe TeamPlatform’s simple and new way of connecting businesses and encouraging people to get involved in project loops will drive project success much more effectively than bulky applications loaded with complicated features”, said Simon Bae, the CEO and founder of VisPower Technologies, Inc.
After a 16-month beta testing period with hundreds of companies from Americas, Europe, and Asia, TeamPlatform has proven its benefits. “Its impact has been truly transformative. The simple and enjoyable project management interface, 3D data previews, video streaming, and the unique workspace sharing feature have enabled all our employees, VARs, and clients, to manage nearly one thousand workspaces with zero training. We rely on TeamPlatform day in, day out for activities as small as trade show prepping projects and client-facing data exchange portals, scaling up to a whole city 3D scanning project involving hundreds of people.” said Calvin Hur, CEO of Rapidform Inc., a leading provider of 3D scan data processing software. In contrast to typical business management systems, TeamPlatform emphasizes organic project stakeholders’ engagement rather than imposing policies, procedures and rules upfront. With a “Get Jobs Done Quickly” design philosophy, TeamPlatform provides a simple-to-use task management tool, a project meta-data structuring tool, and reusable workspace template sharing, which facilitate users to successfully develop business workflows with the smallest overhead. Management has oversight and can leverage past jobs to develop lean and standardized processes met with minimal employee resistance while adapting the new tool to the company. TeamPlatform offers a free plan and a team plan, which allow companies to incrementally add users with little-to-no upfront effort, commitment or cost. Free accounts won’t expire and are made for individuals, freelancers and evangelists to work alone or collaborate with other users. Team plan pricing is simple and very affordable at $25 per month, per member and users can set up a white-label team domain and enjoy advanced features. Visit www.teamplatform.com for additional information about how to sign up for a TeamPlatform account. VisPower Technology has developed TeamPlatform with the goal of helping product design, engineering services and manufacturing companies easily manage hundreds of small or large projects concurrently with huge piles of data. TeamPlatform has come out of beta and is now open to the public. VisPower Technology is privately held and based in Sunnyvale, CA. Change Group Ownership in a Snap! Who’s Been Thinking, Talking and Writing About TeamPlatform? What happens with Read-only sharing of workspaces?